Women and makeup are usually inseparable. You do not need to train a woman to makeup when she is going out for a party or a get together. However, getting ready for the party can be quite different from getting ready for the workplace. It has been observed that many women fail to understand the core ethics that need to be followed while doing makeup for office environment. Wearing makeup for office could be a different story than casual or party themed styling. When it comes to profession, the nature of makeup must synchronize with the persona you want to project. Obviously, no one wishes to come across as rash, wild and irresponsible at job place. However, the way you groom tells how much you understand the job and self. Here are some tips and makeup ideas for every professional/working woman that have been jotted down after considering all the vital facts we just mentioned. The following mentioned are few tips for how to makeup for office natural office makeup tips to follow when going for office. 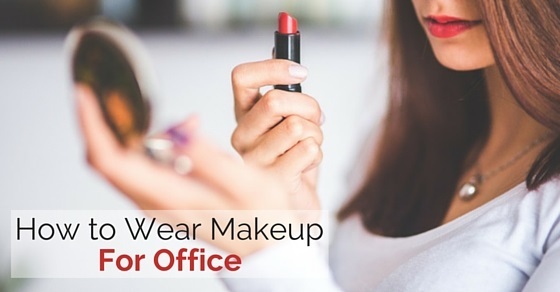 When you do makeup for office, take special care to ensure that the makeup is not too loud. For instance, when you select a foundation, go for a tone that matches your actual skin colour. You can even your skin tone by applying foundation which is delicate and having moisturizing contents. This will help skin breathe fresh, and hide away any patchy or tanned portions. You must use makeup only to conceal the unevenness in your skin. Makeup in itself should never be visible to the onlooker. Eyes are the window to the world. Eyes often tend to express much more than what you express with your speech. It is thus vital that you do a proper eye makeup to create the right impression in office. Look more polished and attractive by brushing little mascara over eyes. Choose a shade, which matches your skin tone. Stay away from electric and flashy mascara shades. While you may be tempted to use one of these loud shades, they look good only during parties and occasions. They need to be avoided if you have a regular office day. You can even experiment with eye shadow and eyeliner. Go for subtle shades that enhance the looks of your eyes. You may check out shades of black, brown and grey as these usually blend well with Indian skin tones. Makeup for office should be used to accentuate the features you possess. It is always advisable to maintain the natural look with simple shades while doing makeup. Your choice of shades can decide how you look and what impression you create in the professional world. Select warm tones for eye shadow like vanilla, browns, plum, peach or golden beige. Carry enough wet tissue papers to blot out any oiliness on face, and cleaning off any smudges. Do not powder or cake your face with too much of compact. Excess makeup not just looks bad but also harms your skin causing it to age quickly. It is always wise to keep it simple. Lip colour should be one that goes with the look on your face. Blood red or dark pink shades only look good on mannequins and puppets. When you select a shade for wearing to office, go for natural shades that blend well with your original lip colour. Be it a subtle lip gloss, lips stain or deep dark saturated lipstick, you must take pride in pampering your pout. It draws attention to face and gives a touch of confidence to a person. Loud lipstick is often annoying. A mild lip shade gives your lip the even look while not looking excessively inviting. Women who are working in the sales and marketing department need to take special care of their looks. They are going to interact with the clients directly and their looks are going to impact their work for sure. For a glowing yet professional appearance, outline your lips, eyebrows and cheekbones with highlighters. It provides a spectacular touch-up to eyes and face, especially, if you work in the evenings. Make sure you do not overdo it and highlighters are used simply to highlight your existing features. Nail colours also need to be chosen wisely when you head to your workplace. A wrong nail shade can harm the whole impression you have created so far. It is vital that you spend some time to select the right shade. Drag a thin shade of matte or pink nail polish over your nails. These shades will help retain the natural color of your nails, yet deliver a suave and professional look, creating a positive impression over colleagues. Avoid funky shades or dazzling nail arts as they look highly unprofessional. Your locks also need to spell the professionalism you carry in your attitude. Wrap your hair up in a bun, but let few strands sway freely down to the sides of your face. If you want to let your hair flow free, assure there are no frizzy or untidy strands. Rather your hair should appear streamlined be it curls, straight or any other hairstyle. A neat hairstyle helps you concentrate your work. Shabby hair and fondling your locks gives an impression that you are not professional in your attitude. The typical bun is the best hairstyle to reveal your professional outlook. Take a graphite shade pencil to sketch on natural eyebrow hairs. Draw on lightly over the arch of eyebrows for a finished look. Massage nourishing balm for silkier brows, and brush slightly the powder pigment to lengthen brows. Make the eyebrows to look naturally graceful. Do not give thick touches as these are easily noticeable. Keep it thin and natural. You may add extra touches during parties and functions but keep simple makeup on a usual working day. Blushes based on pink or peach color work wonders for face. Put some on your face proportionately or touch on those cheeks to highlight best features. However, do not overdo the makeup. Blushes are a great way to conceal the unwanted marks on your face. Go for the natural shades and they look truly impressive. The beauty of natural shades is that they further increase the beauty of your natural features. Once you ave the formal outfit on and the professional look, you are ready for office. The formal outfits vary from region to region and profession to profession. For women, a formal skirt or trouser is ideal for regular office wear. If you are wearing a skirt to office, go for one that is longer than the knees. Short skirts usually make you look unprofessional. In remote areas, outfits like Sarees and Salwar Suits are also acceptable as formal outfits. You need to blend with the office culture and pick the office wear that your colleagues also wear. In an office, there are things you need to do and things you need to refrain from doing. Knowing the do’s and don’ts beforehand will help you do your role effectively. You must be aware of the basic office culture. You simply need to observe your colleagues and coworkers to know how to be. Being the odd one out is never acceptable and it may cause troubles in your professional life. Here we have listed out a few things that you should never do when you are working in an office. Hygiene is something that becomes extremely conspicuous by its absence. While no company will directly state it, it surely expects its employees to be hygienic and well kept. If you are not hygienic, you are bound to create an instant bad impression. Keep nails well trimmed, clean, and use neutral shades as polish. Do not include falsies, which are applicable to nails, hair, eyelashes, and others. In one look, you should appear tidy. If you have a hair fall problem, tie your hair in a closed bun so that hair does not fall here and there. Understand what are the organization’s rules concerning makeup. In some companies, it is okay to have wild streaked hair or bold highlights, but others may find it inappropriate. Stay away from treating self with home-based tanners; rather prefer bronzing oil for extra glow. Usually, firms that handle creative work are usually lenient regarding makeup and dress code. On the other hand, companies that have to tackle serious business always adhere to strict dress code and work ethics. The professional world was male dominated for a very long time. Today, as women are granted equal opportunity, if you take undue advantage of being a woman, it may act against you. It is best to do all the makeup before leaving to office. Do not waste your office hours to do makeup. During office hours, your whole concentration should be on work and not other activities.